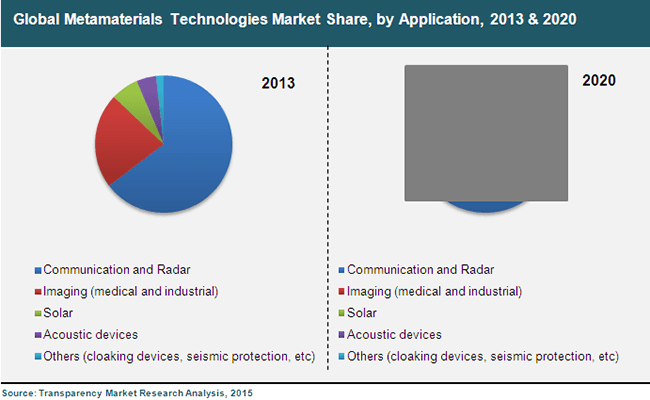 The featured report, titled “Metamaterials Technologies - Global Industry Analysis, Size, Share, Growth, Trends and Forecast 2014 - 2020”, from Transparency Market Research (TMR) offers key insights into the market.According to the study, the global metamaterials technologies market will expand at a marked CAGR of 21.60% during the forecast period from 2014 to 2020. In 2013, the global metamaterials technologies market was worth US$0.3 bn and by 2020, it is expected to be worth US$1.2 bn. The three key performing sectors in the global metamaterials technologies market are evaluated in detail in the report. In 2013, the product segment of radio and microwave frequency electromagnetic metamaterials accounted for nearly 50% of the total revenue generated in the global metamaterials market. In terms of revenue, the application segment of communication and radar held a share of more than 60% in the global metamaterials technologies market in 2013. Geography-wise, North America led the global metamaterials technologies market in 2013 with a share of over 55% in the total annual revenue. Other product segments of the global metamaterials technologies market include acoustic metamaterials, terahertz metamaterials, photonic metamaterials, and others such as infrared metamaterials and ultraviolet metamaterials. Besides communication and radar, other segments of the global metamaterials technologies market include solar power, imaging, acoustic devices, and others such as cloaking devices and seismic protection. The sector of communication and radar is projected to continue its dominance in the global metamaterials technologies market during the forecasting horizon. In 2013, the second largest application segment in the global metamaterials technologies market was medical imaging. Other regions covered in the research study on the global metamaterials technologies market besides North America are Asia Pacific, Europe, and Rest of the World (RoW). North America is expected to continue to lead the global metamaterials technologies market in the coming few years due to easy availability of government research grants, especially in the defense sector, and the considerable investment by venture capital firms in several startup companies. On the other hand, the growing intensity of active collaborations between universities and metamaterials technology companies to innovate various products for civilian purposes will fuel the demand for metamaterials technologies in Asia Pacific and Europe. Although the global metamaterials technologies market will witness considerable growth in the coming few years and many sectors will thrive in this market, it will be challenged by a couple of factors. The global metamaterials technologies market will be constrained by the lack of commercial awareness and technical issues in the high volume fabrication of metamaterials. Nevertheless, the market will continue its strong growth due to the elevated mobile wireless communication, rising preference for improving the efficiency of solar PV, and increasing funding from venture capital firms. Players in the global metamaterials technologies market will benefit significantly from the high potential to develop the invisibility cloak technology. Many companies will also tap into the opportunity presented by the high application potential of graphene metamaterials in the medical sector. Some of the key players operating in the global metamaterials technologies market are Applied EM, Evolv Technology, Inframat Corporation, Metamagnetics, and Opalux.